For the 33rd Annual Reverend Martin Luther King Jr. 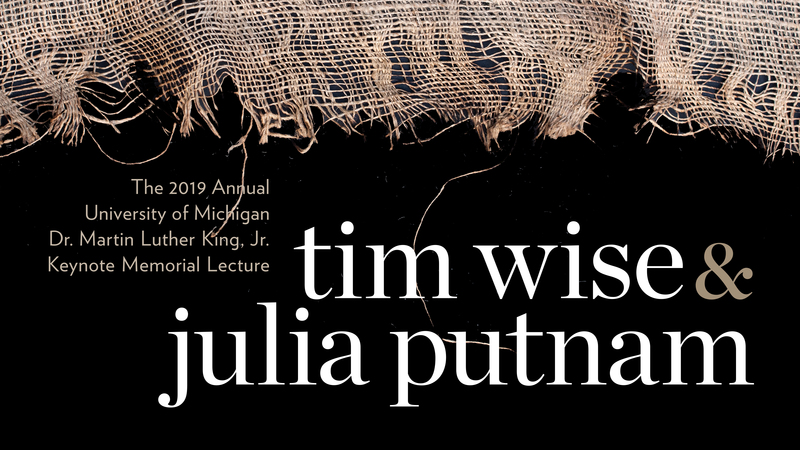 Symposium Lecture, the University of Michigan is welcoming two educational leaders to deliver the keynote this year: Tim Wise, who is among the most prominent anti-racism writers and educators in the United States, and Julia Putnam, principal of the James and Grace Boggs School in Detroit. Both have demonstrated laudable dedication to inclusion and community building. For the keynote lecture, they both will speak about anti-racism initiatives and inclusion in K-12 and higher education and explore how traditional educational practices can sometimes work counter to promoting inclusivity and new ways to educate students. The event is a signature part of U-M’s MLK Symposium, which takes place on Monday, Jan. 21, at 10 a.m. in Hill Auditorium. It is free and open to the public. Additionally, it will be streamed live on the Office of Academic Multicultural Initiatives website, and above once the broadcast begins. Tim Wise is known for his work in addressing racism over the past 25 years. He is the author of seven books, including his highly acclaimed memoir, White Like Me: Reflections on Race from a Privileged Son, and host of the podcast, Speak Out with Tim Wise. Named one of “25 Visionaries Who are Changing Your World,” by Utne Reader, Wise regularly speaks about, and provides training for, dismantling racism to corporate, government, media, law enforcement, and educational professionals across the United States. As principal of the Boggs School, Julia Putnam works with teachers, parents, and students on developing and maintaining positive school culture and ambitious classroom instruction. The pioneering charter school is committed to engaging children around community building. Last year, the school was featured in an NPR series, “State of Opportunity,” which was created to harness the powers of public media and community outreach to drive public conversation and change to yield a better future for vulnerable Michigan children. The MLK Symposium Memorial Keynote Lecture is co-sponsored by Michigan Ross and the Office of Academic Multicultural Initiatives, a unit under the Office of Diversity, Equity and Inclusion, with support from the William K. McInally Memorial Lecture Fund. Past speakers include Hill Harper, Issa Rae, Amy Goodman, Naomi Tutu, and Marc Lamont Hill. To learn more about the MLK Symposium, visit mlksymposium.umich.edu.